Mammoth is a Lifetime basketball hoop company, which has been making great hoops for some time. Lifetime is a Utah started company and their focus appears to be on families. Since people in Utah appear to have more kids, they have really catered to family style hoops. They make great hoops! Mammoth is the top of their line and the Mammoth 90181 is the top of that line. The huge 72″ NBA Regulation sized backboard is sturdy and plays well. It is anchored down with a Bolt-Down Design system that allows you to pack up the hoop in the car and take it with you when you move. You will have to tie the hoop to the top of your station wagon. So, the bottom line is I would play on this system all day long. I could find only minor criticisms with it. The pump height adjustment system is easy enough for my 8 year old to raise and lower it. I don’t fear them lowering it to the bottom height and dunking on it because it is strong enough to take the abuse. Stable.Top of the line. Goliath of a hoop. Looks great and plays well. 72″ tempered glass backboard. It’s the same size and material used on hoops in college and the NBA. It’s also 10mm thick, which is very thick for a glass backboard. It won’t move, and should last for as long as you need it for. This is about as good as it gets. Consider how big your property is when you buy such an enormous hoop. Handle adjust mechanism. I believe that it’s gas assisted, which makes it easier to adjust up and down compared to a crank handle. However, one caveat is that they tend to leak gas over time. Spring-flex rim. Ok. It has a great pro style hoop. It is not my favorite rim. It is a good/great rim, it is just not my favorite. I will admit though that it is very sturdy. It will not bend or disfigure with dunk play. Anchor mount installation. Because the pole isn’t directly buried into the ground, it can be easily taken off the anchor if you need to move it. Lifetime limited warranty. Lifetime itself calls this their deluxe basketball hoop system. They sell great hoops. I have owned a couple and am extremely happy with Lifetime, their warranties and the quality of their hoops. Patented Handle Adjust System. The Handle adjust system is simple. Any child can move the hoop up or down because of the patented air help system. It is the distinguishing feature as I see it on this system. Other than my review, I couldn’t find much around the web. Everything I found is very positive. THIS IS A SICK HOOP. Believe that. Some Vibration Ok. The hoop does tend to move for sustained periods when dunking. I would not call it a problem. I would just say it is something that I noticed and for this sturdy of a hoop it stuck out to me. The Mammoth is one of the best premium basketball hoops on the market. For the price, it’s as good as you are going to get for a Deluxe, 72′ premium hoop. We own a Mammoth and love it. The 98874 is the top basketball hoop sold by Mammoth. The biggest reason is because of the 72″, regulation sized backboard that can be found in gymnasiums all over. It also features a 6″ square one-piece steel pole and a 4′ extension from the pole to the backboard. The height can be adjusted from 7.5 to 10 feet in infinite increments. It’s installed using an anchor mount system. The spring-flex breakaway rim is made out of 5/8″ of solid steel with a wrap-around brace. The 98874 is backed by a lifetime limited warranty. Stable. A 6″ square pole is very sturdy, and the tempered glass backboard is also heavy-duty. It’s very rigid, which is exactly what you want from a basketball hoop. 72″ tempered glass backboard. It’s the same size and material used on hoops in college and the NBA. It’s also 10mm thick, which is very thick for a glass backboard. It won’t move, and should last for as long as you need it for. This is about as good as it gets. To accommodate a backboard this big however, you’ll need a 3-car driveway or better. 4′ overhang. This is the distance from the pole to the backboard. I believe 5′ is the regulation extension. This provides a ton of space for players underneath the rim, and makes it safer because players are less likely to run into the pole. Spring-flex rim. It features a pro-style wrap around brace for support, and 5/8″ solid steel. It’s built to withstand abuse from serious play. Lifetime limited warranty. It speaks for itself. A brand wouldn’t offer a lifetime warranty if they didn’t believe in its durability. Competitive Edge: The Website competitive edge has thirteen user reviews. Twelve of this hoops owners gives it *****Five Stars and one user gives it a ****Four Star Rating. The comments are positive with the theme “Wow, what a Fantastic Product.”! No pole padding. I have seen images that show a pole pad, but no mention is made of it in the product description. Other brands do sell them however if you want one: Deluxe Basketball Pole and Gusset Pad. What’s great about this one is that it covers the base so players don’t trip over it. This is one of the best ones you can buy. The Mammoth 98874 is one of the best premium basketball hoops on the market. For the price, it’s as good as you are going to get. Out of all of the Hoops I looked at, this is the one that I bought. We love it. The 98862 is one of three basketball systems produced by Mammoth Basketball. It features a 60″ tempered glass backboard, a 5-inch square pole, and a 3 foot overhang from the pole to the backboard. The adjustment ranges from 7.5-10 feet in infinite increments with the use of a handle assist mechanism. The Spring Flex Rim features a support brace that wraps around the rim. An anchor mount is used for installation. The 98862 is backed by a limited lifetime warranty. Stable. In-ground hoops provide the best stability. Plus, the heavy tempered glass backboard and 5-inch square pole make it that much more sturdy. Tempered glass backboard. Tempered glass is the best of the best, as it’s used in the college and pro ranks. This backboard is 3/8 inches thick, which is pretty close to regulation size (1/2″). 60″ backboard. The next biggest size is 72″, which is as big as it gets. What I like about 60″ is that it’s not too big for an average sized, 2 car driveway. Certainly 72″ is ideal, but you would need to have a dedicated playing area because it’s so big. Heavy-duty breakaway rim. It looks like a rim you would see in an arena, though it doesn’t break at the sides like the professional ones. Nonetheless, it’s 5/8 inches thick and gives players the freedom to dunk as hard as they want. 3-foot overhang. This provides plenty of space so players don’t bump into the pole, while also having more room for play behind the basket. Gas assisted mechanism. The hoop raises and lowers with the help of gas springs. A customer noted that his leaked after 5 years. The advantage with gas assisted mechanisms is that they’re easier to adjust than their manual counterparts. The downside of course is that they aren’t as durable. One piece 5-inch square pole. The one-piece pole is the most stable, and square ones are more stable than their round counterparts. 5-inches is thick enough for a 60″ backboard. Anchor mount installation. This is the best in-ground installation because the pole can be removed from the anchor. Limited lifetime warranty. I don’t know what’s covered and what isn’t, but you have to love this as a customer. No pole padding. You would think that a basketball hoop priced over $100 would have padding? Not a huge deal, but the padding makes it more safe and gives it more of a professional look. If you want padding, here is one that fits 5-inch poles: Pole and Gusset Pad. The Mammoth 98862 performs as a premium basketball hoop should. The tempered glass, 60″ backboard, the 3-foot overhang, and the 5-inch square pole are big pluses. 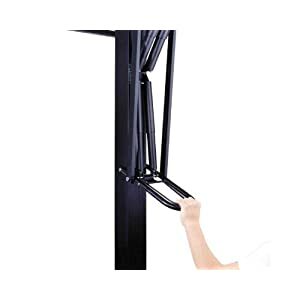 In comparison to the Mammoth 98856, which is a few hundred dollars less, the backboard is 6-inches wider and it has an overhang a 1/2 ft. longer. I think this model is worth the extra money.